Reno Rodeo Social/Economic/Demographic Info Reno Rodeo Info: · The Reno Rodeo has 9 performances. We attract a crowd ranging from 8000 - 10000 for each of the 9 performances. The total number of people passing through the gates of the Reno Livestock Events Center during rodeo week is estimated at 135,000. · The Reno Rodeo is ranked #3 rodeo in N. America for total prize money not counting the National Finals Rodeo in Las Vegas. · The Reno Rodeo is ranked as the #2 richest payout in N. America for outdoor rodeos. · The 2001 Reno Rodeo received a record 1035 entries. · The Reno Rodeo is in its 83rd year. One of the longest running events in the Reno/Sparks area. 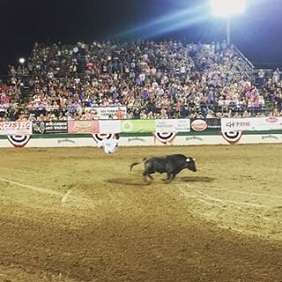 · Nevada is a rodeo state. All Rodeos in the state of Nevada combined pay out more prize money than any other state in the US: i.e., NFR, Senior Finals, PBR, Reno Rodeo, Laughlin, Logandale, Pahrump. · The Reno Rodeo pays out over $1.2 million during the 9 performances and all ancillary activities that take place during the rodeo, i.e., Team Roping, Calf Roping and Team Penning events during the day. · A Reno Rodeo sponsored survey by Marketec during the 2000 rodeo stated that 59% of the patrons are area residents living within 20 miles of the RLEC, with 17% day visitors and 24% staying in the Reno/Sparks area overnight. · The average party size is 3.8, with 3 adults over age 21. · Overnight visitors tend to average 4.1 adults while this drops to 3.0 for day visitors and 2.7 for residents. · Attendance: Overnight visitors attend 2.8 performances compared with 2.5 for residents and 2.2 for day visitors. · A total of 19 percent of the patrons are first time visitors to the rodeo this past year. First time visitors are slightly more likely to be women, between the ages of 25 and 34 or between 45 and 54 and to be overnight visitors from Northern California. The Reno Rodeo is a non-profit organization that has over 400 members in the association, all volunteers. In 1987 The Reno Rodeo Association created the Reno Rodeo Foundation and have since funded over $1 million in educational scholarships, educational programs, literacy programs, disabled children's programs and high school rodeo programs throughout the state of Nevada. Reno Rodeo was officially rebuilt and launched on June 1, 2000 after 5 months in the making. The goal was to communicate information about the rodeo to the world. Visitors spent an average of 7 - 10 minutes per visit to the web site. Want to read more news - click here. Reno Rodeo A History Book - The First 80 Years. For 80 years, the best cowboys and cowgirls in the world have converged on Reno, Nevada for the annual Reno rodeo. Started in 1919 by a group of community leaders, the Reno Rodeo has grown to a nine-day extravaganza featuring a purse in excess of $1 million. Dubbed "the Wildest, Richest Rodeo in the West" it has been called the greatest outdoor rodeo in the world. See our special kids program. For 80 years, the best cowboys and cowgirls in the world have converged on Reno, Nevada for the annual Reno rodeo. Started in 1919 by a group of community leaders, the Reno Rodeo has grown to a nine-day extravaganza featuring a purse in excess of $1 million. Dubbed "the Wildest, Richest Rodeo in the West" it has been called the greatest outdoor rodeo in the world. The all-time winners' list is filled with the legendary name of rodeo: Turk Greenough, Homer Pettigrew, Gerald Roberts, Jim Shoulders, Casey Tibbs, Buster Ivory, Cotton Rosser, Jim Houston, Larry Mahan, Leo Camarillo, Bruce Ford, Charmayne James, Tuff Hedeman, Kristie Peterson and Ty Murry. The list goes on and on. Winners also include local heros like Reno's Cliff Gardner, Gus Bartley and Joe Richardson; Pyramid Lake's Levi Frazier; Battle Mountain's Joe Marvel and Ruby Valley's Charlie Gardner. "Author Guy Clifton's history is neither a dull fiction nor a mere chanting of who, what , why, where and when. Far form it. The 1919-1999 Reno Rodeo sroty leaps majestically off the printed pages, gripping the reader's attention with all the rodeo news that's fit to print." The rodeo is also a reflection of the history of the city of Reno itself. Community leaders founded the eventand have maintained it through the Great Depression, wars, good and bad economic times. Politicians and dignitaries, from the city's mayor to state officials, participate in the annual rodeo parade. The rodeo is put on by volunteers, who donate thousands of hours each year to ensure its success. This is the story of the Reno Rodeo as told mainly through the words and camera lenses of three newspapers the Nevada State Journal, Reno Evening Gazette and Reno Gazette-Journal. Like the volunteers who put it on, the local newspaper has been with the rodeo since its debut. Many of the photos originally appeared in the pages of the newspaper. The Nevada Historical Society, through its Ernie Mack collection, also contributed many photos, particularly form the early years of the rodeo. The subtitle of this book "The First 80 Years" is an indication there will be many more Reno Rodeos to follow. It is an integral part of Reno's past and its future.